The Georgian is super dog friendly inside and out for friendly dogs. Rosie’s a regular, living just a few streets away. Food to die for too! Public house providing bar meals, entertainment and BT & Sky Sports. Beautiful old stone building housing a stylish lounge bar. Dogs welcome but must be kept under control at all times. We are a Family run Pub in the heart of Biggar. Locally Sourced Food and Beer. Dogs are welcome with well behaved owners! We offer a unique country charm, quality food and traditional ambiance that is both friendly and inviting. 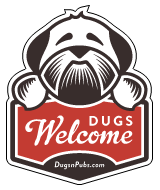 There are a total of 13 dog friendly listings in the Lanarkshire Pubs category. Please log in, or sign up as a member to view all listings.